I’m not proud to admit this, but as recent as early 2016, I shunned second-hand stores because I thought they were only for the poor. I loved browsing through flea markets and thrift stores – especially the vintage antique stores, but only for the entertainment value as if they were museums. Certainly never with the intent to purchase. To purchase society’s hand-me-downs simply implied that one was financially unable to purchase new items – that’s the only reason why I believed someone would buy second-hand. And I did not want to appear poor. Fast forward to today and I have a near-180° perspective change. I’m currently working in Amsterdam but as I prepare for my return back to the States, I am scouting out all the second-hand shops in the Boston area. As soon as I obtain an apartment, my intent is to visit these shops to furnish my apartment with as many second-hand items as possible. Not because I’ve suddenly run into financial difficulties; not because I have no other options, but simply because I WANT to shop second-hand. What Items Do I Buy? Does buying second-hand items take away buying opportunities from people who need discounted items? Purchasing second-hand means giving an item a second-life. It means one less thing that will have to be manufactured from new resources. One less thing that will be sent to the landfills to accumulate past our children’s lifetimes. Manufacturing new products not only use new raw materials, but takes energy and time to produce, requires transportation to/from various manufacturing facilities, warehouses, and stores, and requires fancy packaging to appeal to the consumer. On the other hand, second-hand items have already been produced, they are generally sourced from your own neighborhood, and can be purchased without superfluous packaging. Personally, it is also a point of pride to be able to know that I can furnish a chic home from a thrift store because instead of buying into whatever Anthropologie or West Elm is suggesting (and ending up with a home that looks like everyone else’s). Instead, I am able to use my own style preferences to find unique items for my home. Shopping at thrift stores also prevents overconsumption. When I visit a second-hand shop, I will seek out and purchase exactly what I’m looking for. At retail stores, I often find myself going in for just 1 thing and ending up with 5 things. A few years ago, I visited Anthropologie to purchase a cute cotton blanket that I’ve been seeing in a window display that I frequently walked by. I deliberated for a week to make sure that I needed it and truly liked it. When I was sure, I visited the store on the weekend. After an hour perusing the entire store, 3 floors and all, I emerged with shopping bags in hand. However, in addition to the blanket, I also came out with some cute vintage-looking drawers knobs, a 2-piece set of ombré drinking glasses, a giant table-top hourglass, and some decorative tea towels. While all of these items are pretty, and there is a case to be made about occasionally purchasing items that bring you joy, these ended up being spur of the moment purchases that appealed to me in the store. Brought home, they quickly lost their charm and faded into the background as additional clutter in a minimalist home. I never ended up installing my drawer knobs, but boy were they cute. Unfortunately, they ended up being donated when I moved to a different city across the country. At thrift stores, I personally draw the line at items that I cannot clean in its entirety. Though everyone should determine their own personal comfort level with thrift store items. For me, this cuts out many electronic appliances, bedding and stuffed items, and large furniture. I do not like that I cannot completely reach all the little nooks and crannies of anything, even for new items. I’ve wanted an air fryer for a while now because I love fries, but I can’t figure out how I would clean it properly so I haven’t purchased one yet. There are a wide variety of items available at second-hand stores. The above list is tailored to my own needs and accounts for my preference for a relatively sparse home. Compile your own list and enjoy the thrill of the thrift hunt! In my junior year of college, one of my friends purchased a brand-new, well-fitted suit at the Goodwill store. She was so happy because the tags were still on and it for only $30. My initial thought was that this was selfish; here she was, a financially-comfortable student with a high-paying summer internship taking away a $30 suit that someone less well-positioned could really use. In my mind, second-hand and thrift stores were for the benefit and needs of the lower income. I was wrong. As is often the case. More business and more demand overall for the goods in a second-hand store allows the store to offer lower-profit items (such as socks) for those who need it. Some people draw the line at not purchasing anything that goes into the bedroom – I’m totally fine with it as long as I can wash it on my own. I personally would not purchase pre-worn socks because I have this unfounded fear that most people have smelly feet, but there are people who have no problem with it. If you find something second-hand that you can use, please, do use it. Because if a product doesn’t sell quick enough, the thrift stores will start moving it to the landfills. Plus, at the rate that we, as a society, consume and dispose of items, there are more than enough second-hand items to go around. Remember too that when you buy second-hand, you do not have to commit to it forever. If you purchased a soap dispenser from the thrift store, but then stumble upon a dispenser in a store a few months later that you absolutely love, purchase it and re-donate your initial second-hand dispenser to give it a third life. Compare this to purchasing a new, but standard-looking, soap dispenser from Target once you arrive at your new home. You can’t just put off purchasing a soap dispenser because you need to be able to wash your hands. However, why purchase something new that you don’t absolutely love if you know there may be a high chance it will be replaced within the year? Even if you purchase second-hand goods as a starter item, that’s infinitely better than purchasing a new item as a starter item, destined for the landfills. I avoided thrift stores to avoid being perceived as low-income. The irony is that the year I was the most financially comfortable is the year I embraced the concept of second-hand goods. Low-income individuals may shop at thrift stores because they need to, but everyone can shop at thrift stores because they want to, can, … and should. While lower-income individuals may buy second-hand items more often, the reverse is not true: shopping second-hand often does not mean you are low-income. 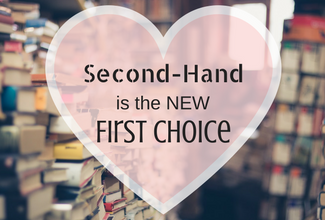 Second-hand is now my first choice because it encourages the re-use of resources, conscious consumerism, and provides support for stores that offer a secondary market for those who rely on them. Supporting these stores can help you, the community, and the planet overall. Will you join in providing support? I can relate to this article so well! I use to frown upon thrift stores until one day I happened to walk into one I realized how much I could be saving! I love thrift store shopping! I love going to second hand shops and looking St all the ornaments and books fro yester year. I love second hand shopping!! And I have found some of our favorite furniture pieces on yard sales or even in trash piles on the side of the road!! One man’s trash is another man’s treasure!! Yeah for sure! I live in Amsterdam and find stuff in amazing condition all the time set on the side of the streets. Though I wish people would donate it properly instead.